Trustco has quite a few properties in its portfolio, and several developments ongoing. In order to gauge the market, and to ensure that it does not oversupply the market, it is necessary to examine the property market as a whole and see what trends emerge. In Namibia, this usually means taking a look at the FNB Namibia House Price Index. This index tracks property prices based on bonds registered at the Deeds Office, with bond prices used as a proxy for house prices, since there’s no central register for house prices in Namibia. However, as a general guide towards the property market, this would be quite sufficient. So what can we glean from the report? Well, during 2018, property prices have been in decline, with the average property price down to N$ 1.177 million from a high in March 2017 of N$ 1.246 million. These declines can be traced to the luxury segment of the market, where prices have come down by 29.4% over the last year. In terms of volumes, however, growth has been on the increase – growing by 27.8%. This growth is mostly fuelled by an increasing housing supply in the lower and middle price segments, especially in the north. Trustco’s property developments are mostly in the upper-middle segment of the market, so the luxury declines don’t affect it. In terms of locations, the two primary residential developments are the Ombala Estates in Ondangwa and the Elisenheim Lifestyle Village in Windhoek. So let’s have a look at the regions. In the central municipalities, prices have continued to contract, with the average house price down to N$ 1.45 million, down from it’s peak of N$ 1.605 million in November 2017. This is mostly driven by declines in Windhoek, with Okahandja and Gobabis still posting increases in house prices. While the average house price in Windhoek has declined to N$ 1.57 million (down 2.7%), price in Okahandja has increased by 9.1% to N$ 1.02 million, with Gobabis increasing by 21.2% to N$ 1.1 million. In the north, prices have increased by 3.2%, bringing the cost of the average house to N$ 833 000, but with prices expected to moderate down to N$ 750 000 down to increasing volumes. Here as well the luxury segment of the market is struggling, and strangely the prices vary wildly in towns. Rundu saw the highest price increases with 49% in the last year, now having a average house price of N$ 1.08 million, while Omaruru, for example, saw house prices drop down to N$ 840 000 after declining 24.4% in the last year. At the coast, prices have continued to drop, bringing the average house price down to N$ 1.12 million. This has been because of a two-pronged pressure, arising from both increased volumes as new land was serviced, as well as uncertainty in the mining, tourism and fishing sectors, which reduced demand. Here Henties Bay house prices have overtaken those of Swakopmund, with the average house price there now N$ 1.35 million after growing 13.4% in the last year, while Walvis Bay saw an 11.3% drop in house prices, pushing the average house price below N$ 960 000. In the south of Namibia, house prices have continued to rise, with the average house price now at N$ 750 000. However, volumes have remained flat, and with land delivery slowing down in the south, prices look set to contract. However, FNB warns that with these low volumes, the data on the ground remains thin, and interpretations should be taken with a grain of salt. In this region, Keetmanshoop saw the greatest price increase (24.3%) with the average price going up to N$ 850 000, while Mariental saw the greatest decline, with prices dropping to N$ 930 000, down 30.5%. 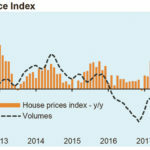 With the economy still knee-deep in a recession, housing demand continues to drop, while at the same time pressure is being applied to government for affordable housing, meaning that land delivery and housing supplies is increasing. For buyers, purchase opportunities are opening up. 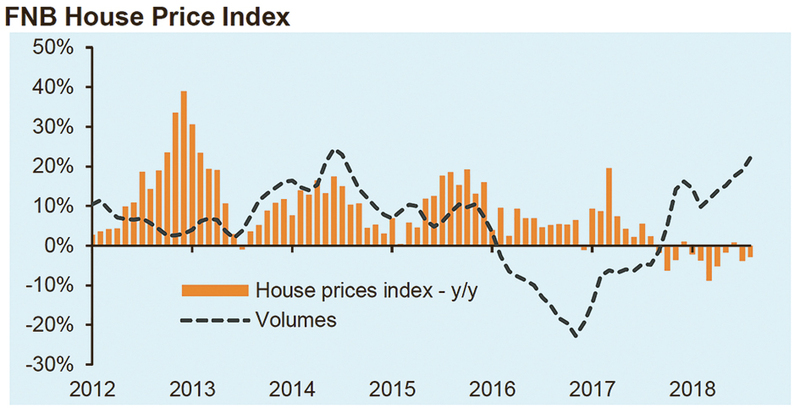 FNB expects that while house prices may have dropped 5.8% in 2018, that contraction will shrink to 1.2% in 2019, before growing again in 2020, albeit at an inflation-related increase. For Trustco Properties, this provides valuable insight, especially with the timing of serviced land delivery, which usually requires quite a bit of lead-up and development before they can become available. By timing those development to the property market, it ensures that whenever demands pick up, Trustco can be there ready – and willing! – to supply the market with its needs.